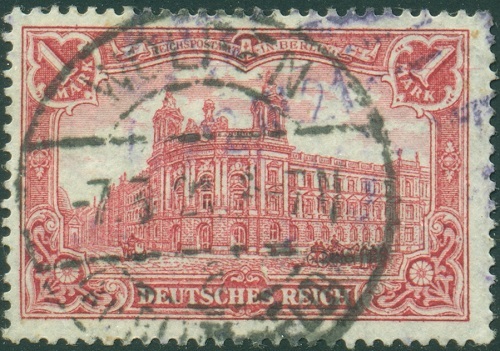 The German Empire definitive postage stamps produced between 1914 and the beginning of 1919, are referred to as the "Wartime Printings". 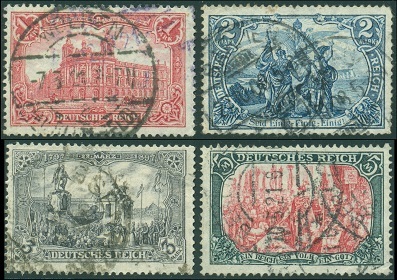 The thirteen major-type German Empire Germania and Representative Subjects stamps shown above, known as the "Wartime Printings", were issued between 1914 and 1918. These stamps were printed on paper that was watermarked lozenges. In the Wartime Printings, the paper is of poorer quality, sometimes with a grayish or yellowish tint, the colors are duller and darker, and the fine details of the vignette are course and a little smudgy. 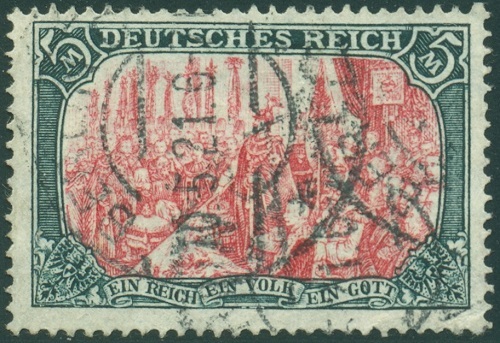 This is especially evident in the bi-colored stamps, where the vignette is printed in black. The fine details in the crown, in Germania's hair, and in the leaves on the sprig Germania is holding, are almost gone and are now coarse and smudgy. Super-sized images of the Wartime Printings of the Mark denominations are shown above. Determining the printing characteristics for these can sometimes be a bit tricky. The Mark denominations of the Wartime Printings are duller looking, sometimes have darker colors, and the fine lines in the vignettes are not as discernible as on the earlier printings. The watermarks are also less distinct on these issues, than on those of the Peacetime Printings. Here is what the Michel catalog says about these. Here is the literal English Translation. Blurred print resolution; Porous quality, sometimes yellowish paper; Watermark indistinct; White gum, strong shiny and dull or yellowish with brownish breaks. I find the translation of the Michel definition of the Wartime printings somewhat confusing. I have made some personal observations, which might be of additional help here. On the Mark denominations, the outer frame lines almost always show weakness. This can appear as bleeding, chipping, or flaking along the edges edges of the frame lines. In some cases, as with the 5 Mark above, the color impression is missing, showing what appears to be frame-breaks. The engraved fine detail of the designs is often dark and smudgy. On solid color areas, the ink impression can look uneven. Some of the Wartime printings of the Mark denominations have 26x17 perforation holes, identical to those used for the Peacetime printings. These are all very scarce. The most common of the Wartime printings have 25x17 perforation holes. These perforation hole varieties were ONLY utilized for the Wartime printings. All of the Mark denomination stamps shown on this page are of the 25 x 17 perforation hole variety. The catalog attributes of the Wartime Printings are as follows. 03 Pf. (1915 - Mi. #84II, Sc. #81) - Brown, Dark Brown. 05 Pf. (1915 - Mi. #85II, Sc. #82) - Green (Shades). 10 Pf. (1915 - Mi. #86II, Sc. #83) - Red, Carmine Red, Orange Red, Lilac Red. 20 Pf. (1915 - Mi. #87II, Sc. #84) - Blue Violet, Light Blue, Ultramarine. 25 Pf. (1915 - Mi. #88II, Sc. #85) - Orange & Black on Yellow. 30 Pf. (1915 - Mi. #89II, Sc. #86) - Orange & Black on Buff, on Cream. 40 Pf. (1915 - Mi. #90II, Sc. #87) - Lake & Black. 50 Pf. (1915 - Mi. #91II, Sc. #88) - Purple & Black on Buff, on Yellow Orange. 60 Pf. (1915 - Mi. #92II, Sc. #89) - Magenta, Red Violet. 80 Pf. (1915 - Mi. #93II, Sc. #91) - Lake & Black on Rose. 01 Mk. (1918 - 26 x 17 - Mi. #94AII, Sc. #92a) - Carmine Red. 01 Mk. (1915 - 25 x 17 - Mi. #94BII, Sc. #92) - Carmine Red. 02 Mk. (1916 - 26 x 17 - Mi. #95AII, Sc. #93b) - Bright Blue. 02 Mk. (1916 - 25 x 17 - Mi. #95BII, Sc. #93) - Bright Blue. 03 Mk. (1919 - 26 x 17 - Mi. #96AII, Sc. #94c) - Violet Gray. 03 Mk. (1918 - 25 x 17 - Mi. #96BII, Sc. #94) - Violet Gray, Black Violet. 05 Mk. (1916 - 26 x 17 - Mi. #97AII, Sc. #95b) - Slate & Carmine. 05 Mk. (1918 - 25 x 17 - Mi. #97BII, Sc. #95) - Slate & Carmine. In 1915, there were two spectacular production errors that accidentally occurred. Through the use of the wrong type of watermarked paper, a number of the 5 Pf. postage stamps, were printed on paper with the Cross and Circles watermark (Mi. #85IIaWU, Sc. N/L). 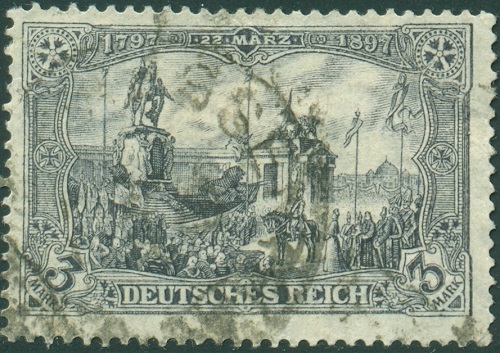 This watermark was commonly used by the Kingdom of Württemberg on their official stamp issues, but it was NEVER used for German Empire postage stamps. 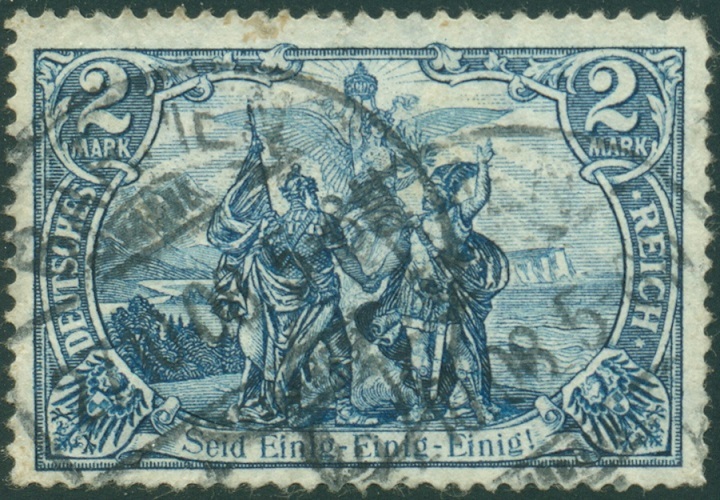 The Cross and Circles watermark (on a Württemberg stamp) is shown above. Likewise, a few of the 3 Mk. denomination stamps were printed on paper that was watermarked circles (Mi. #96BIIaW, Sc. #102). This type of paper was used for German Empire revenue stamps but never for postage stamp printing. Both of these German Empire production errors are VERY RARE. 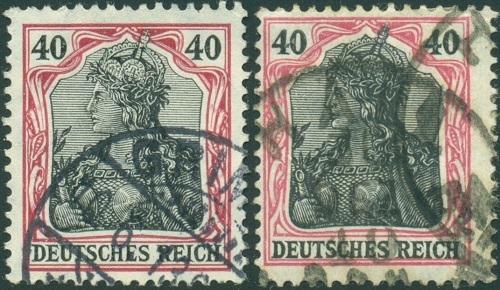 The seven major-type Germania stamps shown above were issued between 1916 and 1919. Except for the 75 Pf. 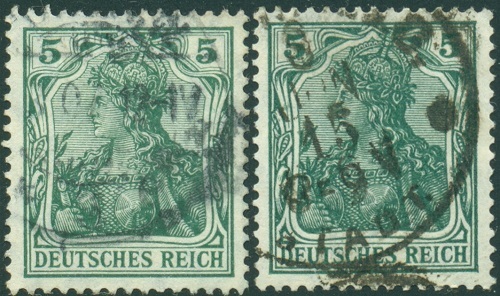 denomination, there is a white field behind Germania, instead of the horizontal lines used for previous issues. 02 Pf. (1918 - Mi. #102, Sc. #96) - Light Gray. 02 1/2 Pf. (1916 - Mi. #98, Sc. #97) - Light Gray. 07 1/2 Pf. (1916 - Mi. #99, Sc. #98) - Red Orange. 15 Pf. (1916 - Mi. #100, Sc. #99) - Yellow Brown, Olive Brown. 15 Pf. (1917 - Mi. #101, Sc. #100) - Dark Violet, Blue Violet, Blackish Violet. 35 Pf. (1919 - Mi. #103, Sc. #101) - Red Brown, Lake Brown. 75 Pf. (1919 - Mi. #104, Sc. #90) - Green & Black. During 1919, following the end of World War I and the Versailles Treaty, the Weimar Republic was declared, and the German Empire came to an end.